Have you ever clicked on an unread email in the Outlook inbox and then wondered why it suddenly becomes marked as ‘read’, even though you have not actually read it yet? Or perhaps you sometimes find it difficult to locate your unread emails amongst all the read ones because the two don’t look that different. 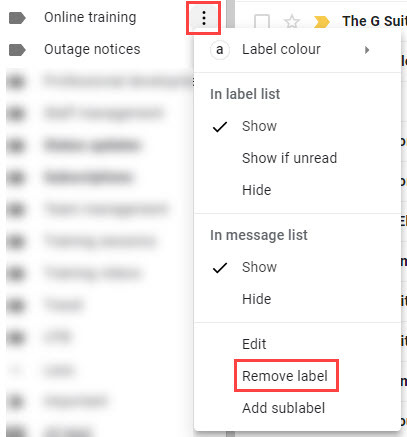 In this blog post, I’ll show you how to fix these issues by customising the unread mail settings in Outlook. Note: The steps and images shown in this post are for Outlook for Office 365 (Windows desktop version 1902, March 2019). Some things may look a little different if you are using another version of Outlook, but the general process will remain the same. If you find the default appearance of unread mail too subtle, you can customise the colours and fonts used to make unread mail really stand out in your inbox. 1. Select the View tab, then View settings. 2. Click the Conditional Formatting button. 3. Click on the Unread messages rule to select it, then click the Font button. 4. Choose a font, font style, size and colour that will make your unread emails really stand out in your Inbox. Here is a before and after image to show you what a difference this can make. 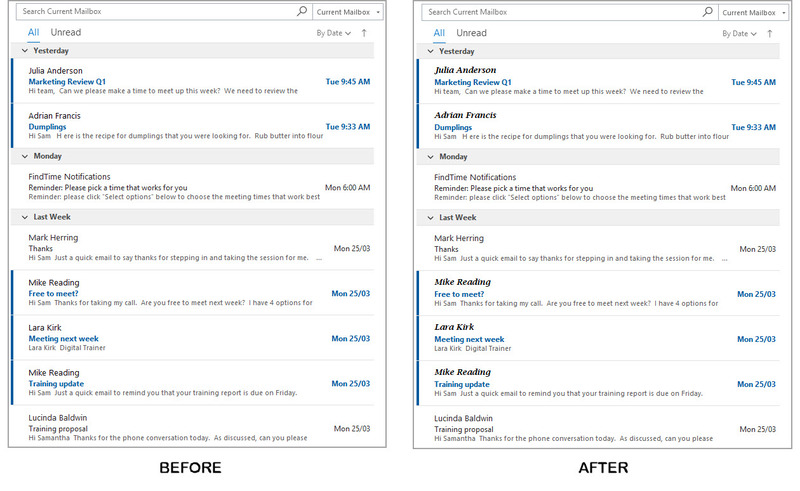 I’ve kept these changes minimal, but it has still made the unread emails easier to distinguish. 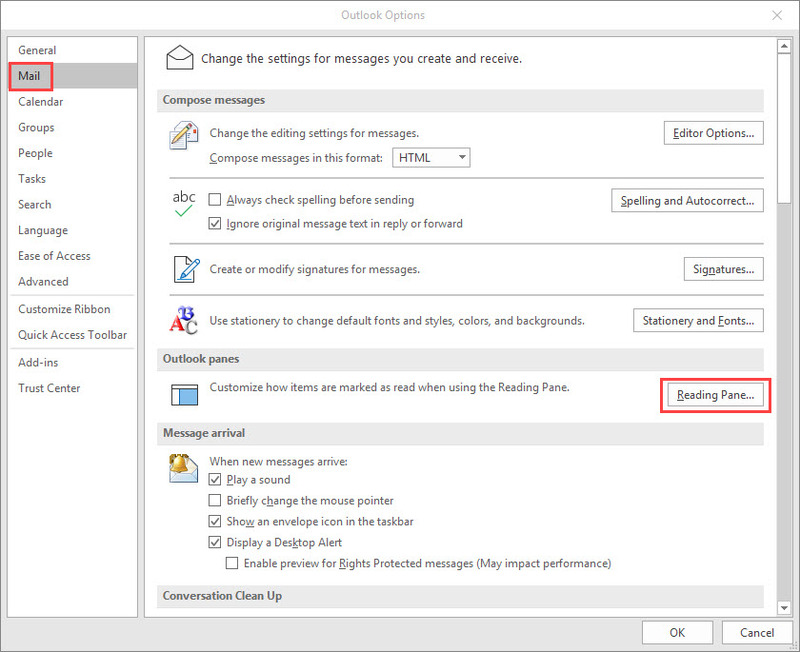 There are two settings in Outlook that control how and when an email is marked as read. Both involve what happens to mail when it is viewed in the Reading Pane (the box on the right hand side that displays a message). 1. Select the File tab, then Options. 2. Select Mail from the left-side menu, then click the Reading Pane button. 3. Tick, un-tick or edit the following two settings to suit your needs. You can either disable both settings (which means you will need to manually mark messages as read), or choose the one that you prefer. 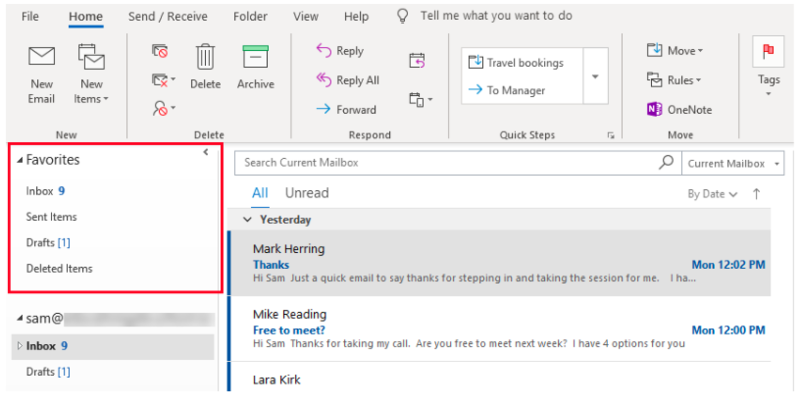 Mark items as read when viewed in the Reading Pane: When you click on an unread email in your Inbox and it is displayed in the Reading Pane, Outlook marks the message as read after a default of 5 seconds. 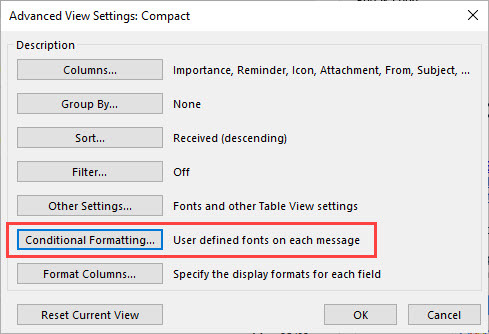 You can disable this completely, or increase the number of seconds that Outlook will wait before marking the message as read. 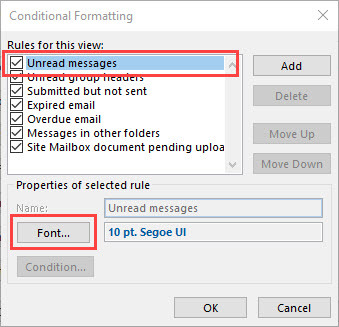 Mark items as read when selection changes: Outlook will mark a message as read when you have clicked on it, and then move away from it and click on another message (i.e. your message selection changes). 4. Click OK when you are done. Mark a message as read: Ctrl + Q, or Cmd + T on Mac. Mark a message as unread: Ctrl + U on Windows, or Shift + Cmd + T on Mac. Here’s a full list of Outlook keyboard shortcuts for Windows and Mac if you’d like to save even more time! Interested in getting more efficient with Microsoft Office 365 tools? Contact us to find out more about our face-to-face and online training options for your organisation. Prefer to see these search tips in action? Folders have long been one of the main ways to organise your emails and keep your inbox tidy in Microsoft Outlook. However, if you’ve been using the same email account in Outlook for a while, you’ve probably ended up with a long list of folders that can be cumbersome and time consuming to navigate. In this blog post, I’ll share three tips you can use to better organise your folders for greater efficiency. 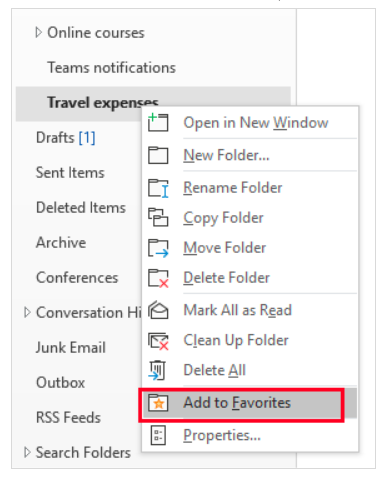 The Favorites list sits right at the top of the Folder Pane in Outlook. Note: If you don’t see Favorites, you may have turned it off. To turn it back on, choose View > Folder Pane > Favorites. Favorites contains shortcuts to folders you use frequently. By default it will probably show the Inbox, Sent Items, Drafts and Deleted Items of the first email account you have in Outlook. You can add any other folder from any of your email accounts to Favorites. This is a great way to make your most important or most used folders really quick and easy to find and use. Right click the folder and choose the Add to Favorites option. Click the folder to select it, then choose Folders > Add to Favorites from the ribbon. Dragging and dropping it to the desired position. 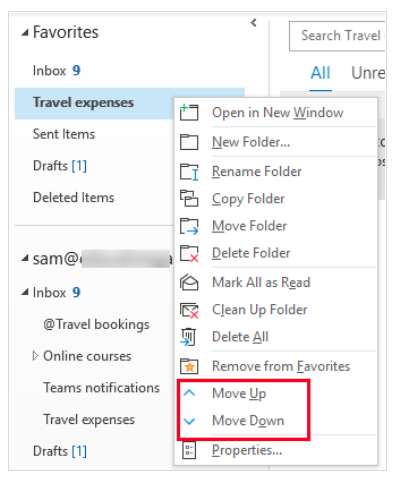 Right-clicking the folder and using the Move up and Move down options. Once you start using Favorites, you may find that you get a bit too enthusiastic about favoriting folders and end up with a Favorites list that is too long! To avoid this, it is a good idea to periodically check over your Favorites and remove any folders that are no longer your most important or frequently used. Right click the folder and choose the Remove to Favorites option. Click the folder to select it, then click the Folders > Add to Favorites button in the ribbon to deselect it. If your folders have been created under your Inbox (i.e. 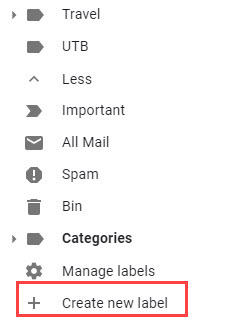 are subfolders of your Inbox), they are in alphabetical order by default. The only way to change this order is to use symbols or numbers as part of the folder name to force particular folders to sit at the top alphabetically. Here is an example of what that looks like using the @ symbol at the start of the folder. 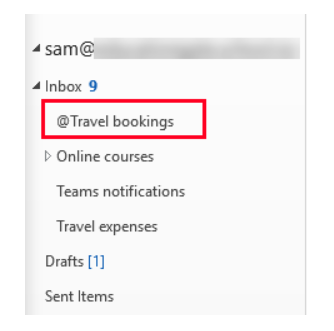 Instead of the ‘@Travel bookings’ folder being in the ‘T’ section, it is shown right at the top of the folder list. You can add a symbol or number to a folder name by right-clicking the folder and choosing the Rename folder option. Any number and most symbols will work as part of the name. You can even use emojis too! If your folders have not been created under your Inbox (i.e. are just part of the folder list for your account), you can drag and drop them to change the order. 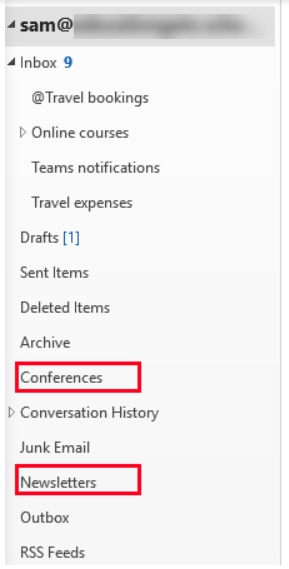 In the example below, the ‘Conferences’ and ‘Newsletters’ folders are not sitting under the Inbox and can be dragged and dropped into any order. One of the reasons that your folder list may become long and cumbersome is because you have folders that you no longer actively use, but don’t want to delete. This tends to happen when people move between different positions, projects or clients within their organisation and their filing structure changes. 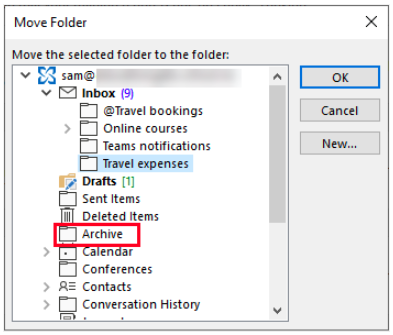 Outlook has an Archive folder that can be used to help keep the Inbox clear. This feature is also really useful for storing folders that you no longer use but don’t want to delete. 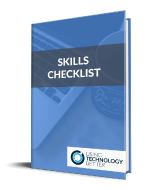 By moving these folders to Archive, your core folder lister becomes shorter, more relevant and more efficient to navigate. However, it is still really easy to access your archived folders if you need them. The Archive folder is located in the Folder Pane. Each email account within Outlook has its own Archive folder. 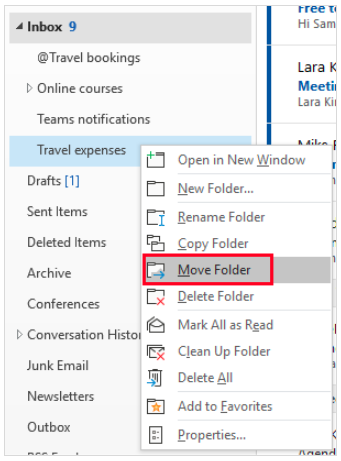 Right-click the folder and choose the Move folder option. In the box that appears, choose the ‘Archive’ folder within your email account, then click OK. 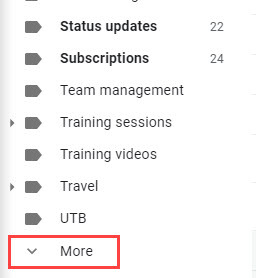 If you ever need to move a folder out of Archive, you can simply repeat the steps above and choose your Inbox or email account as the location to move the folder back too. 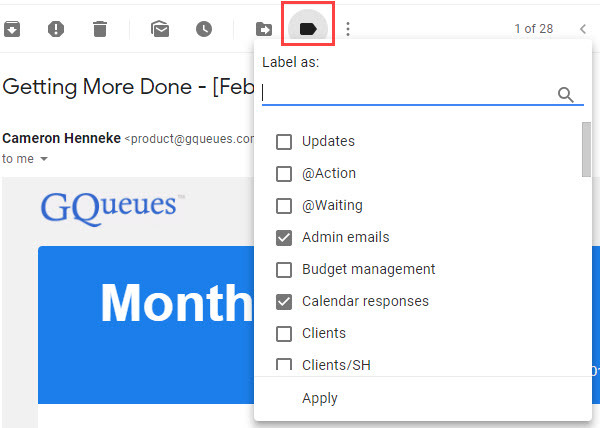 If you spend a few minutes of your time today organising your Outlook folders using these three tips, you’ll spend less time navigating your Inbox and more time on the tasks that matter. Many of us are now working with a G Suite account as our primary source of a digital word processing tool. Some of us are using it as our secondary source – but whichever way we are doing it, there are times when we just may want to access it offline. Sam wrote an earlier blog here about the ways that you can set up your account in order to be able to access it when you are not connected to the internet. It’s an incredibly helpful blog if this is something you need to regularly. Last year I worked with a teacher who lived on the outskirts of the town where she worked and their wifi was almost non-existent. When I showed her Sam’s blog I thought she was going to kiss me! She was so excited! It changed her life for the better.So if that is you, check it out. Sometimes though we may only want to make one or two docs available. As I write this I am on a plane from Adelaide back to New Zealand, and Air New Zealand has free wifi available. This is such a novelty but also raises a question around security. The wifi is provided via satellite and there are some people who would rather not use it. There are also times, on domestic flights for example, when wifi is not available. You may be off to the beach for the weekend and you know the internet connection there is a bit dodgy. I don’t really want to sync my whole account offline but I want to be able to access a couple of docs. With just a small amount of forward planning this is quick and simple to do. The trick here is to begin at the home page for the tool you are wanting to access offline, i.e. Docs, Sheets, or Slides. At the moment these are the only three it will work for. 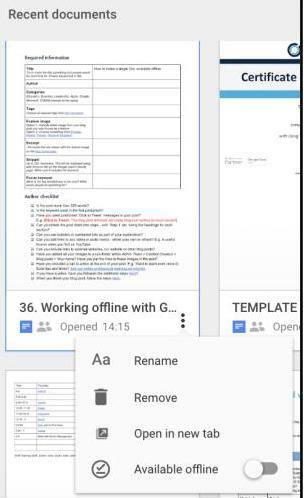 sheets.google .com will take you to a similar looking page with all your Google Sheets and yes, slides.google.com will do the same for your Google Slides. Now you’ll notice, in the bottom right-hand corner again, the option to make it available offline. Click on the tick on the left-hand side. You’ll see a pop up window that asks if you want to make all your files available. There’s a link provided to explain how. If you just want this doc available go ahead and click the blue button that says ‘Turn on’. When you click on the three dots again you will see the doc is now available offline. You’ll notice also that you now have the offline icon under the name of the doc. You can now access that doc without being connected to the internet, and when you do connect again it will all sync. Just remember – if it’s a shared doc the other people involved won’t see any changes until you are back online. So there we are – there are no excuses now for not getting that blog post written or that task finished while in the air or away at the beach. 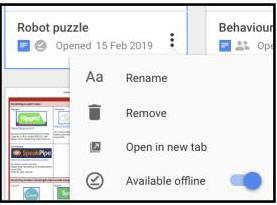 For more tips and tricks with G Suite tools, you might like to check out Lara’s blog here on how to quickly and easily format Google Docs or Sam’ blog here that will show you how to customise and use text styles in Google Docs. The measurement format (metric or imperial) used in page dimensions, headers and footers, tables, object size and positioning and more. The document language. For English users, this will be either UK or US. For users who choose a non-Latin language, the ‘Input tools menu’ will show in the toolbar. Learn more here. The locale and timezone setting in Google Sheets. In turn, this impacts the currency and date formats used. Note: Changing your language settings in your Google account will only affect new Google Sheets that you create. To fix an existing sheet, select ‘File’ > ‘Spreadsheet settings’ from the menu in the sheet. 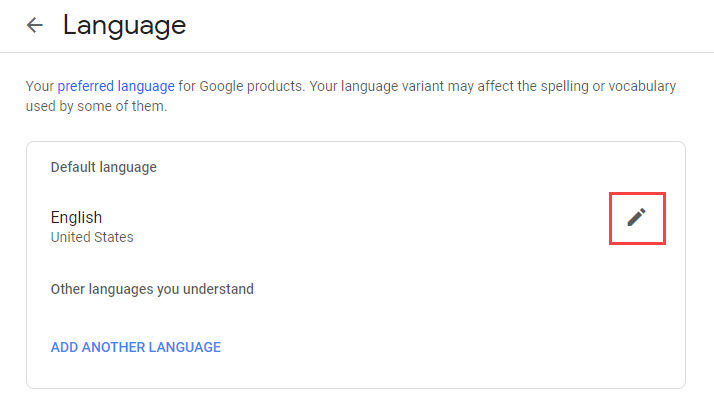 Note: The language setting in your Google account is different to the language settings in Gmail, Google Calendar and Google Chrome. If you’re looking to fix the language used for Gmail’s spell-check feature, check out this post. 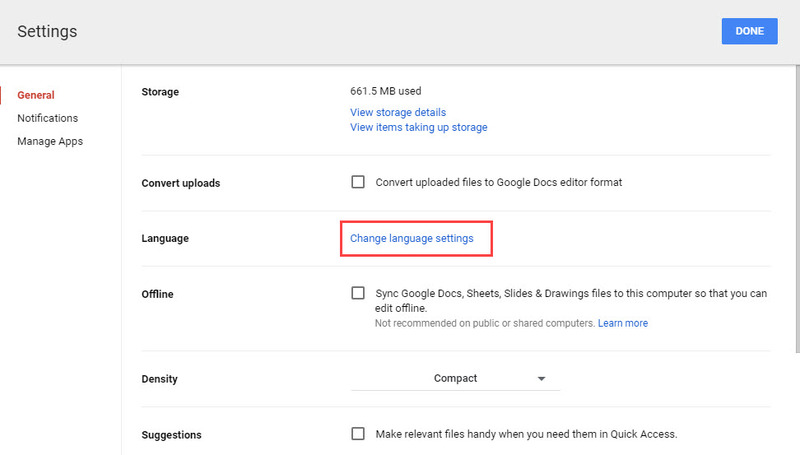 Follow these steps to change your language setting in your Google account, via Google Drive. Click the Settings (cog) button > Settings. 3. Click the Pencil button next to the default language. 4. Search for the language you want. Click it once, then click Select. Tip: If you want an English language, you must first search for English, then click on ‘English’ to display all the variants. 5. Your default language will be updated. You can now close the language settings tab. 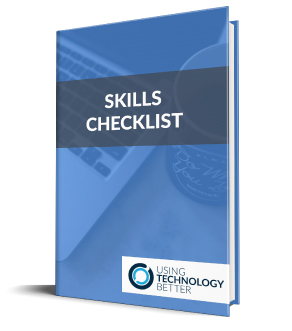 Want to learn how to use the spell check feature inside Google Docs, Sheets and Slides? Check out this blog post from Donna. Prefer to see it in action?